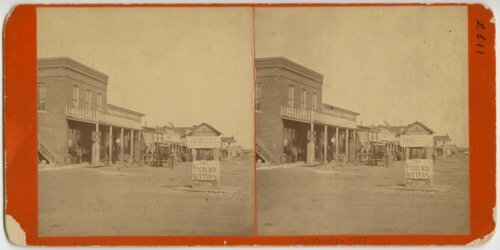 This is one side of a stereograph showing Front Street looking east in Dodge City, Kansas. There is a sign on the street that reads "Prickly Ash Bitters, Fire Arms Prohibited". The stereograph was donated in June, 1879, so the photograph was probably taken in late 1878 or early 1879.